The newest addition to Venice's restaurant row is the curiously-named Wolf in Sheep's Clothing, a pop-up dining concept housed within Capri, an otherwise mediocre Italianate restaurant. The kitchens here are helmed by the duo of Brian Dunsmoor and Kris Tominaga, two bona fide Abbot Kinney veterans. Dunsmoor was last cooking at the reopened Axe on AK, and before that worked Sous Chef positions at The Hungry Cat and the venerable Joe's, and also served as chef de partie at Providence. 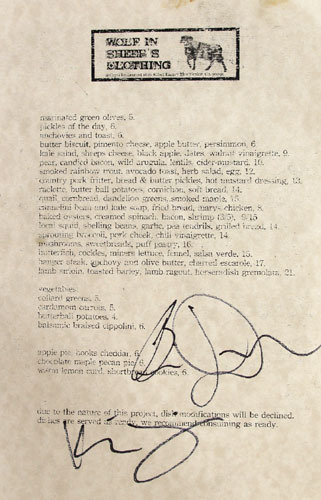 Tominaga, of course, was previously Chef de Cuisine at Joe's, and also cooked at the famed L'Espalier in Boston. Following a few preview nights, WiSC debuted on December 1st and is planned to continue through February, offering up the Chefs' interpretation of Southern-inflected, locally-sourced fare. The interior of Capri has been maintained for the most part, though the two Chefs have certainly made their mark on the space. Of note are the motley, mismatched assortments of flatware, dinnerware, and chair-ware (including some vintage mid-century pieces by Eames and Saarinen), as well as artwork by Dunsmoor's girlfriend, Lacey Cowden. 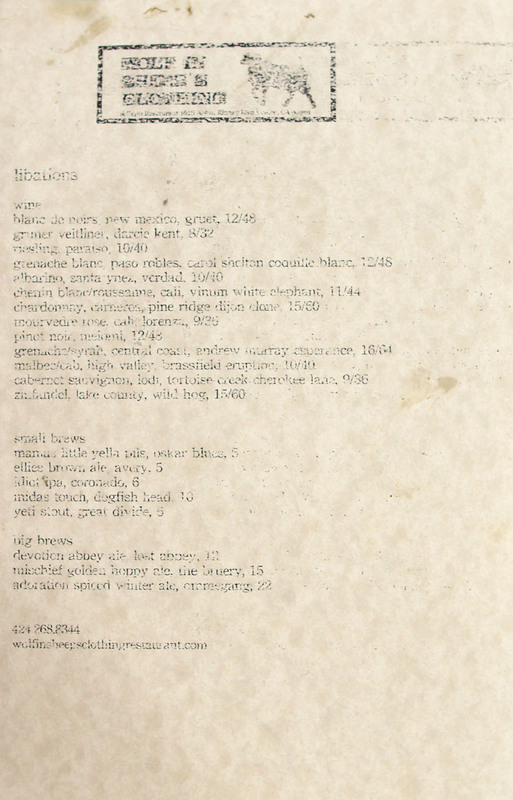 The menu at Wolf in Sheep's Clothing, raw and rustic in essence, draws inspiration from American Southern cookery. 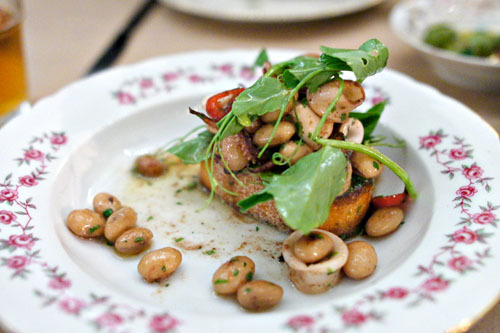 The food is complemented by a focused list of Cali-centric beers and wines. Click for larger versions. 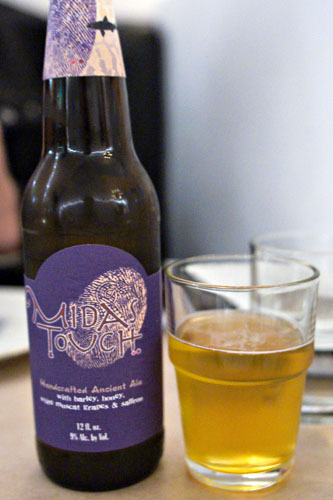 To drink, we started with a couple of beers, the nicely tart, surprisingly restrained Idiot IPA [$6] from Coronado Brewing Company, as well as Dogfish Head's always intriguing Midas Touch [$10]. 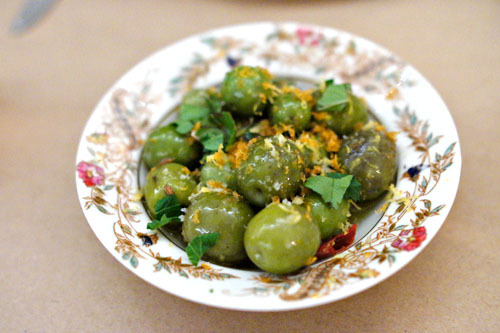 Given that I'm not huge into olives, I wasn't terribly excited when a complementary plate of them arrived at our table. Perhaps I should've been, though, as these were pretty fantastic, some of the best I've ever had in fact, with their hearty bite and satisfyingly piquant relish, beautifully accentuated by a citrus-y tang. What I am huge into is, however, is squid, and this was a prime example of such. The cephalopod itself I found buttery, supple, yet snappy in consistency, with a delicate savor that was adroitly set off by the countering flavors of the tendrils and garlic confit. Meanwhile, the beans added a certain weight and starchiness to the dish that worked wonders as well. Our next course was tremendous, easily some of the best cooked oysters that I'd ever had. 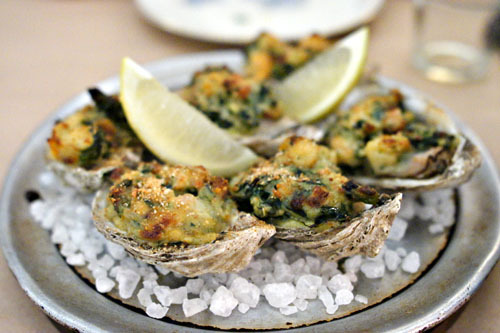 The salty, smoky bacon paired perfectly with the spinach, and complemented the still ascertainable salinity of the bivalves beautifully. The shrimp, meanwhile, added some textural variation, and we found that the dish was even better with a squeeze of lemon. 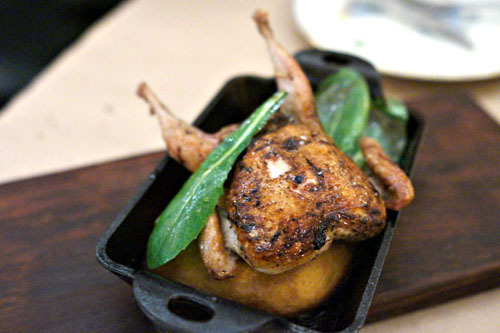 Quail was rather delectable as well--tender, succulent, and brimming with a marked savoriness that matched flawlessly with the herb-y zest of the greens. The bird easily stood on its own merits, but the corn bread actually managed surprisingly well here, adding, along with the maple, a certain sugariness to the dish that just worked. A brick of pig was up next, and it did not disappoint. 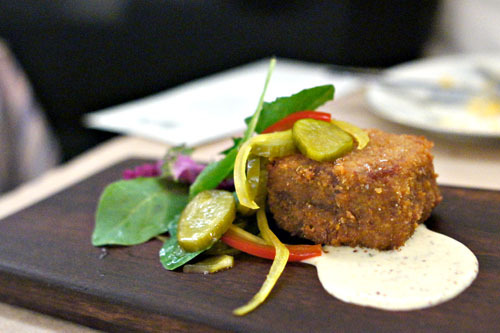 The fritter comprised a perfect mix of creamy and crisp textures, and displayed an abundance of porcine goodness that linked up beautifully with the mustard and pickles, which did a great job in cutting the considerable gravity of the pork. 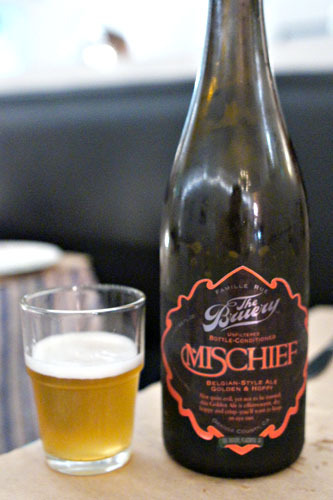 Next up to imbibe was The Bruery's Mischief [$15], a lovely Belgian-style pale ale showing off a good balance of fruity and hoppy flavors, with a delightfully spicy bite. The butterfish came recommended by our server, and I'm glad we didn't doubt him. 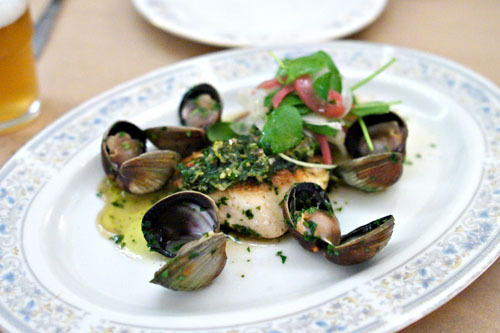 The fish itself was spot on both in terms of taste and texture, and paired superbly with its pungent accoutrements of salsa verde and miner's lettuce. However, the most interesting thing here were the cockles, which had an immense ocean-y relish to them that really accentuated the inherent salinity of the fish. 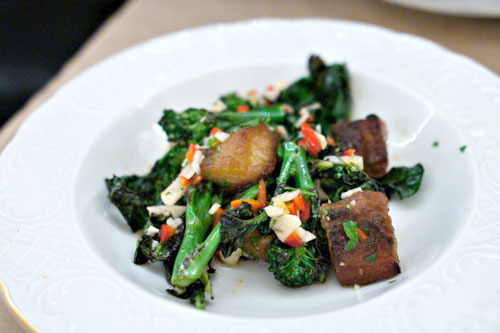 A dish of broccoli and pork jowl was delicious as well. The meat showed off a delightfully crisp outer layer, along with a lip-smacking taste that was deftly moderated by the vegetables. At the same time, the vinaigrette added a pinch of heat to things that really finished the dish nicely. 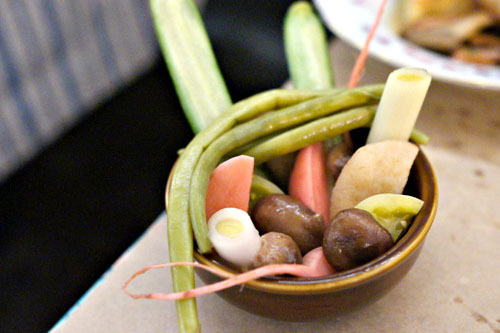 The Chefs offer up a rotating selection of pickles, and tonight we enjoyed onion, green bean, carrot, cucumber, Asian pear, and mushroom varieties. All were on point, and worked as great, tangy counterpoints to the richness of the dishes to follow. Sweetbreads were excellent, some of the best I've had in a while in fact, with a very subtle, very refined relish that conveyed the essence of the offal in a forceful, yet not overbearing manner. Using the puff pastry, with its mild flavor and flaky consistency, was a smart decision here, and I liked the counterbalancing earthiness imparted by the mushrooms as well. Our final savory course of the night was a doozy as well, and quite possibly the best hanger steak that I've ever had (with the other contender being one of Ludo's). The beef arrived at a perfect temperature, making for a cut of steak with amazing flavors and a gratifyingly toothsome bite. 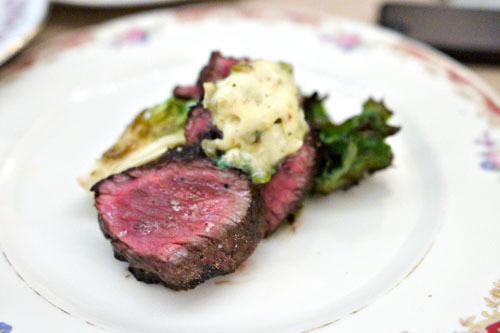 It was further enhanced by the use of a compound butter, while the escarole endive tempered the plate with its bitterness. 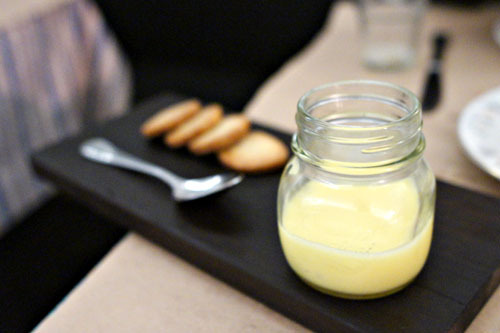 Moving on to the desserts now, our lemon curd was fascinating. It possessed the citrus-y tang that we were expecting, but also conveyed an unmistakable unctuousness that caught us off guard. The overall effect was actually slightly disconcerting, though things did come together with the shortbread. We closed with a traditional apple pie, finished with what was to me a non-traditional topping of Hook's cheddar (it's actually somewhat common in other parts of the country, apparently). The pie was as you'd expect, but I did appreciate the addition of the cheese, which imparted a salty counterpoint to otherwise sugary nature of the dessert. I didn't expect all that much going into the meal, but boy did Dunsmoor and Tominaga deliver, banging out a litany of strong, soulful dishes that really did convey the honest, unassuming ethos that the two were aiming for. In fact, Wolf in Sheep's Clothing may be doing Venice food better than anyone else on AK at the moment, quite a feat given that the restaurant had only been open two days. As for what's next for the Chefs, WiSC may take up residence permanently in the Capri space, in partnership with current management (though they'll probably change the name). Or, the restaurant could move to a new location altogether; we'll just have to wait and see. ooo I think I'd like that bruery beer! Love that you did a beer pairing for this meal! 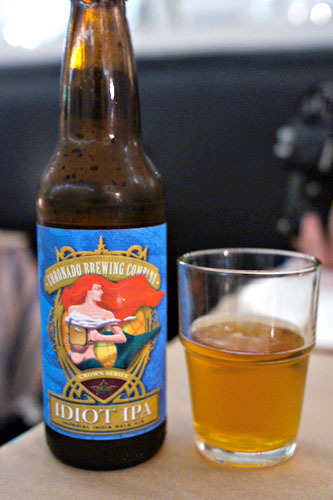 Darin: More often than not these days, I find myself reaching for a beer to pair with my food. Anon: Interesting--I've never heard of such a thing before. Can you elaborate? Great write up Kevin. Glad you enjoyed our mushrooms. Concur with Anonymous w apple pie & cheddar cheese being a pretty common thing in the past -- now it's more of a European & New England thing. I happen to love the combo... sweet, spicy (and ideally, still slightly crunchy) apples contrasting against melted gooey-creamy & savory cheddar. 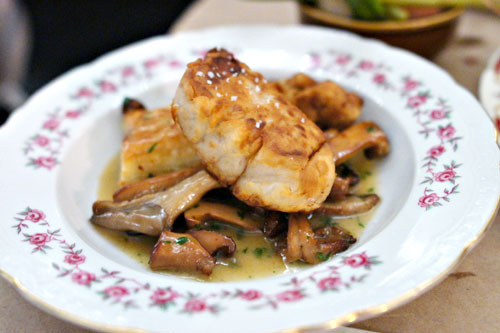 Matt: Nice job with the mushrooms! HC: Interesting. I've asked around, and nobody seems to be familiar with the concept. Guess it's really not a west coast sort of thing. Agreed with HC and Anon. 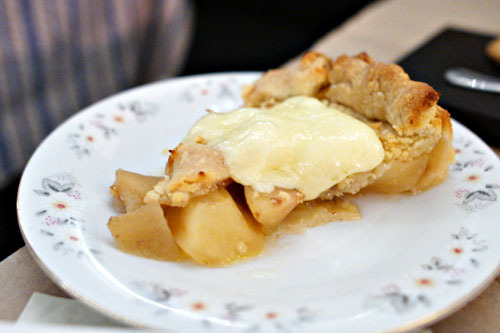 Cheddar Cheese and Apple pie is a classic combination I've had growing up in Nor Cal. Since I'm not a fan of cheese, it wasn't my favorite combination in the world. Anon, Danny: Post has been updated to reflect this new info. Nobody I've asked down here has had apple pie with cheese, so it must be a really regional thing.